This week marks a somber anniversary for our nation. On April 19, 1995, a truck bomb detonated at the Alfred P. Murrah Federal Building in Oklahoma City, killing 168 people, including 19 children. At first, investigators believed it to be the work of Middle East terrorists, as White House Chief of Staff Leon Panetta describes below. But within days, authorities discovered the perpetrators were two domestic terrorists—Timothy McVeigh, who received the death penalty in 2001, and Terry Nichols, who is currently serving life in prison. Having been associated with a radical paramilitary group based in Michigan, the two men said they were driven to act by a searing anger over the deadly federal raid of the Branch Davidian compound in Waco, Texas, which happened on the exact same day two years prior. 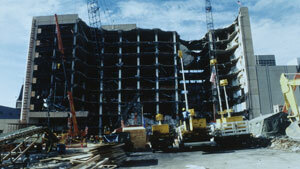 A bomb hidden in a Ryder truck ripped apart the Federal building in Oklahoma City in 1995, killing 168 people. Four days after the bombing, in response to the tragedy, President Clinton traveled to Oklahoma City and delivered a speech to begin the healing process for the nation. It also provided the president with a sizable bump in polls, having just been rebuked by voters during the “Republican Revolution,” when the GOP took control of both houses in the 1994 midterm elections. Here, some of Clinton’s top advisors of the day talk to the Miller Center’s William J. Clinton Presidential History Project about how the Oklahoma City bombing helped shape the Clinton presidency. Cisneros: No, it took him a lot less…. I always thought that one turning point for him was the Murrah Building and the attack in Oklahoma City. I saw him get much more sober and serious about what he was dealing with and what he was entrusted with. I saw his demeanor change after that and Ron Brown’s death and some of the other hard things that we went through. Q: You went down to Oklahoma City, didn’t you?... Can you tell us anything about that trip? Cisneros: My department lost more people than anyone else. We lost 35 of our colleagues, some of whom I had seen just the week before. This was very personal. Then I had to deal with the survivors, went to the hospital. Saw the people who were hurt and the people who were not hurt but were afraid to go back to work and did not want to go back into a Federal building. So it was very personal, very poignant. 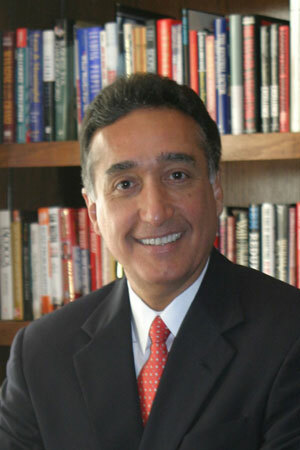 Cisneros: Did a magnificent job of relating to the widows and children at the ceremony that day. It was very touching. There are moments when—and I think 9/11 was that for President Bush—you realize this is not about politics and this is not about momentary victories and this is not about your own legacy. It’s about the burden you’re carrying for the people. I have said in other settings that I thought that was a pretty dramatic turning point for him. So by ’95 I think he was operating on all pistons as President of the United States, for everybody. [It] really gave [Clinton] a chance to show to the American people that he was a leader who cared.... A terrible tragedy, but for him, politically...a very important moment. Rubin: [The Oklahoma City Bombing] really gave [Clinton] a chance to show to the American people that he was a leader who cared about a whole host of matters. A terrible tragedy, but for him, politically, as was written at the time, a very important moment. Galston: The President was back on his heels in early 1995. Things hit bottom right before the bombing of the Federal building in Oklahoma City and sort of rebounded. He found a voice and very cleverly linked that episode with hostility of government run amuck. I think he began to turn the corner perceptually about that point. But mainly what was happening was jousting. Was there a lot of domestic policy going on during that period? Hell, no. How could there have been? Greer: Then the Oklahoma City bombing happened. That was such a disturbing experience. I thought that initially the White House reaction was not that good. So I wrote a memo about what I thought the nation needed, in terms of pulling the nation back together, and also taking on extremists and extremism, and Clinton loved it. I heard, because people called saying, “He just sent me a copy of this memo, we’ve got to talk about this.”… There was a real turning point in his administration, and it was the speech at Oklahoma City.… I thought that from that point forward…Clinton found his voice. It came back and he really became a national leader. It was really the first time, I thought, that he had been a national leader. McLarty: [T]here was a sense that this was a President who genuinely understood people’s hopes and dreams and fears and anxieties and identified with that. You can maybe chuckle a bit about “I feel your pain,” but he does have, and did have, great empathy. That showed at Oklahoma City, it showed at the [flight 800] TWA crash [in 1996], it showed over and over again. And people did feel that he was getting up every day and going to work for them. And most people, even his detractors…felt he was reasonably fair-handed about this. I heard that over and over from many of the business leaders that I dealt with…. The intellect and the communication skills clearly differentiated his presidency from other presidencies. 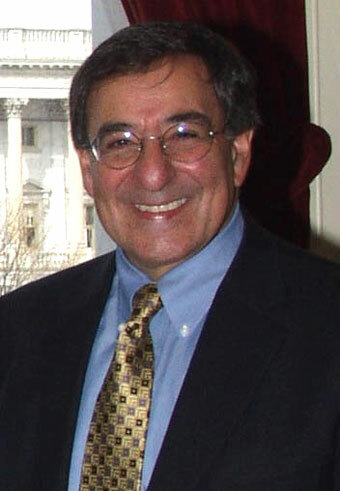 Panetta: So in April suddenly Oklahoma City happens and, a little like September 11th, the country starts thinking, Wait a minute, terrorism is real and this can attack and kill our own people. And as you may recall, there was a whole sense at that time that the people involved with Oklahoma City were Middle East terrorists. That’s what we were looking for on airplanes. The FBI had gone to the airports. As a matter of fact, I think they may have arrested somebody at an airport, thinking it was somebody from the Middle East. And to his credit, in the statement the President made about what had happened in Oklahoma he also made the point that we have to be very careful about not jumping to conclusions. He just seemed to be able to rise above it and do what Presidents are supposed to do in those situations. And he did it very well. We put a task force together in the White House and we charged the task force to track it through, and ultimately we tracked it to these guys and arrested them. It was done pretty fast. 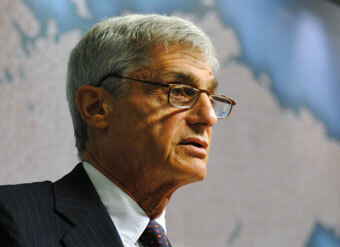 But the President throughout that period was very reassuring to the public, and I think it began to turn things around. The President began to reassert the position of the Presidency at a time of crisis, and he did it very well. He did it in a way that I think the public responded to. Even though it wasn’t a foreign terrorist attack, it showed just how vulnerable everybody was. If a Timothy McVeigh can do that once, what could terrorists do around the country? One of the things I don’t think Clinton has ever gotten full credit for—even though it has been written about extensively—is how much he did on the anti-terrorism front and how much he really did prevent and tee it up. You can drive yourself crazy thinking about whether you could have prevented 9/11. But clearly Clinton understood the terrorism threat and did a lot about it. He tried to set up a system that would prevent future attacks. It escalated a little bit with the Oklahoma City bombing and Timothy McVeigh. Even though it wasn’t a foreign terrorist attack, it showed just how vulnerable everybody was. If a Timothy McVeigh can do that once, what could terrorists do around the country if they wanted to? Q: Where were you when that news came across? What was your initial reaction? Soderberg: I was in the White House, in my office. In the Situation Room, they bring up papers. One dot means, “Read it now.” Two dots mean, “You really have to read it now.” There really are two little red dots on it; it’s goofy. I can’t remember if it was a one or two red-dot one. Initially we thought it was foreign terrorists. But it became pretty clear pretty quickly that it wasn’t. Then there was the whole manhunt to get them. It was a big deal. I went with Clinton to the speech in Oklahoma City, and it was really moving. I’d gone to high school in Oklahoma, so I wanted to go….. It was just a sea of families. The Governor or somebody had given them all teddy bears. There were all these sobbing families clutching teddy bears…. 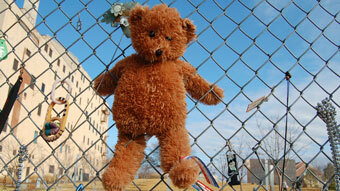 A teddy bear at a makeshift memorial after the Federal building was bombed in Oklahoma City in April 1995. Q: Is he scripted at those moments? Or are we seeing a more spontaneous speech from him? Soderberg: His speech was scripted, but very him. He would have spent some time on it. He would rewrite a lot of the big speeches himself. I think it’s very difficult to be a speechwriter for Clinton, because he rewrites so much at the last minute. It was very him. Then he did a lot of unscripted meetings with the families. Q: Were you with him during those meetings? Soderberg: It was more milling with the crowd, so I was just watching. I wasn’t that close, but I could see and hear what he was doing. Soderberg: He wasn’t asking that question. He was saying, “This is a big deal, we have to get on it.” He got it right away. He knew the terrorism threat was a major headache for everybody and we had to get on it. And it wasn’t, “What do you think?” It was, “This is the future; we have to get on top of it.” He always got it, and he always understood.